Rochester is lucky enough to have two Greek festivals, and we just went to the "second" one last Sunday. I had the "vegetarian dinner"--spanakopita, Greek potatoes, Greek salad, dolmades, and pita bread--and then a HUGE baklava sundae. 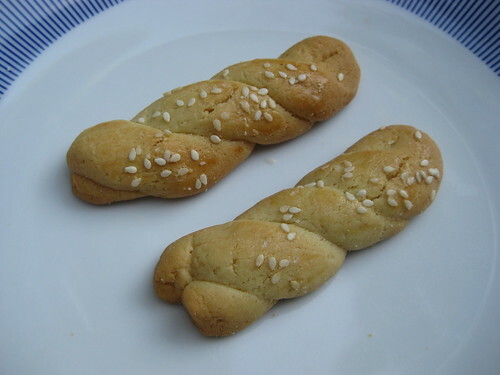 We brought home a little bag of koularakia, too. The festivals are similar: They're both free, and they both offer plenty of delicious food, including pastries and cookies to take home (and those baklava sundaes, yum). You can enjoy Greek wine and beer, watch traditional Greek dancers, and go on church tours. And you can browse the tables selling food products (like olive oil), clothing (spotted: a T-shirt that says, "One ouzo, two ouzo, three ouzo, floor"), jewelry, and religious items and books. Where: Greek Orthodox Church of the Annunciation, 962 East Ave.
Where: Greek Orthodox Church of the Holy Spirit, 835 South Ave.
Cupcakes are $2.50 each (a sign by the register mentions a $10 credit-card minimum), frosting shots cost $1.50, and on the day I went, the friendly staff was offering free samples of purple, iced sugar cookies. The bakery has no seating except for a table with a sign proclaiming it a "consult table," which must be for special orders. 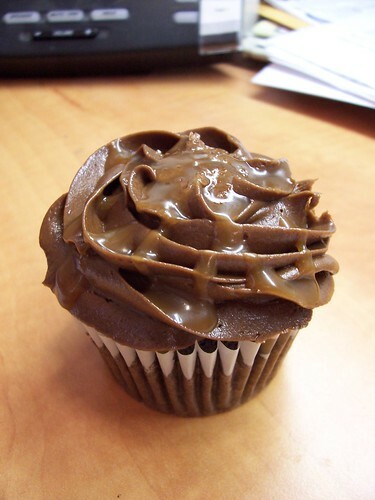 I will definitely be back for another salted caramel cupcake--the frosting was some of the best I've ever eaten. 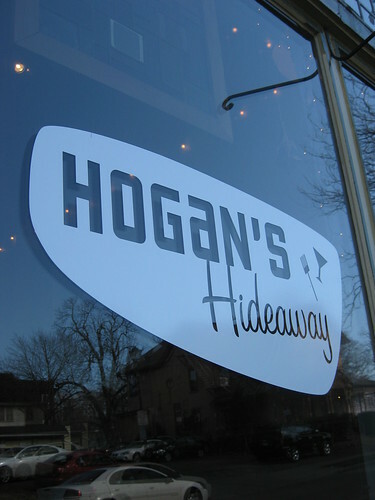 I've wanted to blog about Hogan's since March, and I keep thinking, "I'll wait until I have time to sit down and write a 'real' entry," but that's just not going to happen in the near future. So instead, here is a short version with a few photos from a Saturday lunch there. 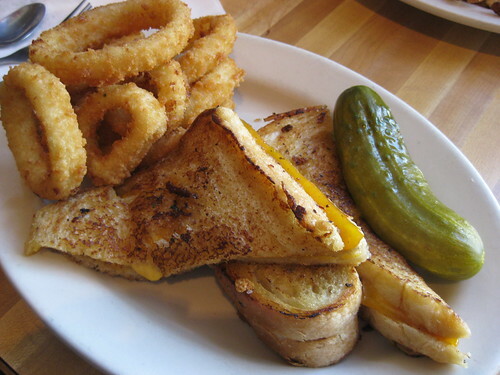 Hogan's is one of my favorite places for lunch in Rochester, partly because of their perfect onion rings. They're breaded, not battered (just my preference); crunchy; and not too greasy. 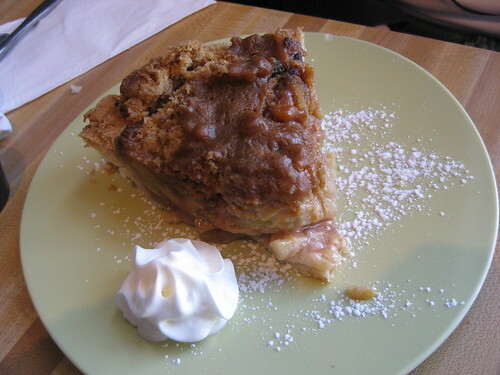 A recent suggestion from my grandmother and uncle (who both have a sweet tooth like I do ... perhaps it's hereditary?) led me to Leo’s Bakery & Deli for the first time. Although I’ll use it here for simplicity’s sake, the word "bakery" doesn't adequately describe Leo’s; the place is more like a combination of a bakery, deli, mini supermarket, and specialty food store. 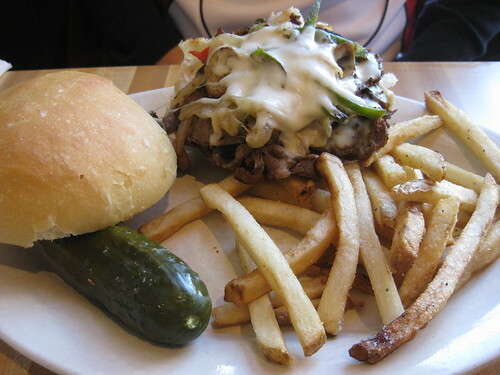 The deli counter has subs and panini, cold drinks, and prepared foods like wings, lasagne, and salads. Near the counter is a section that features the key ingredients of an Italian dinner: pasta, olive oil, sauce, and others. A small freezer holds frozen foods ranging from clams casino to ravioli. Another area holds shelves full of desserts packaged to take home, such as cakes and pies, and even half-cakes (which I’ve never seen before--but what an excellent idea if you want to buy more than a slice but less than an entire cake). I saw at least one table of St. Patrick’s Day stuff, too. (This was before the holiday.) The opposite side of the bakery offered some more grocery basics, including honey and bread, as well as plastic containers full of Italian cookies by the pound and other pre-packaged goodies. While exploring the bakery, I saved the best for last. My relatives had mentioned the very long bakery counter, and they weren't kidding. Wow. I walked back and forth a couple of times, finding it tough to decide on something, and then I realized that I would be happy with almost anything inside it. Leo’s makes cookies, bars, cannoli (I counted six kinds--SIX), cupcakes, Italian cookies (including my favorite striped ones, which apparently have multiple names), and so many more sweets. 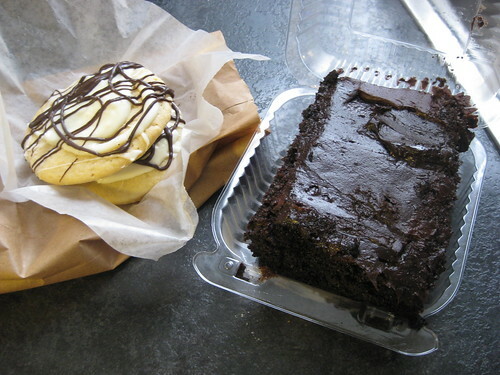 Since I couldn't just stare at the sweets all day--I had to actually make a decision and order--I picked an Oreo brownie for myself ($1.25) and a piece of tiramisu ($2.49) to bring home for Clem. Even though the brownie was dense and fudgy (which is fine; I just prefer cake-like brownies), the rich chocolate taste and thick buttery frosting won me over. 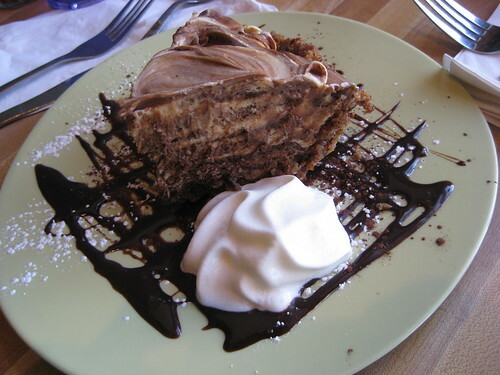 And the tiramisu was a hit with Clem. 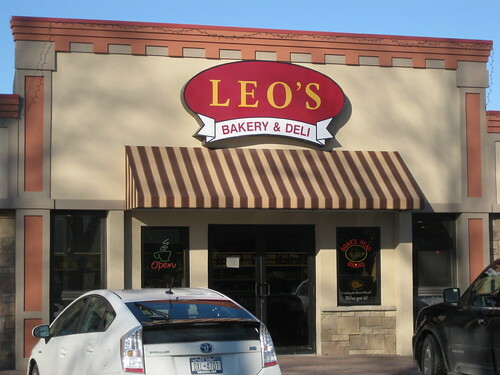 TIP: Leo’s sells some local favorites, like Pittsford Dairy ice cream, and The Pierogie Guy’s pierogies (which we must try soon, starting with the “garlic smashed potato” flavor listed on the website…). NEARBY: Another bakery, Etna Italian Pastry Shop (which I haven’t tried yet and have been planning to), and various other businesses at the Piano Works Mall. I wanted to check out A Second Thought, but I discovered they’re closed on Mondays. It takes me a long time to go grocery shopping because I always find interesting things to check out—things that are not on my shopping list. I'm easily distracted by exotic fruits or kitchen gadgets or new granola-bar flavors: “Ooh, look at that!” So I could spend quite a while in Lee’s Oriental Foods. I’ve seen a few of the items before, but many of them were either new to me or were things that you’re probably not going to find at Wegmans, like red-bean ice cream or frozen taro bars. The first thing you see as you walk into Lee’s Oriental is the small produce section. Most of the food in the store is packaged (cans, boxes, bags, etc. ), but the produce area offers a small variety of fresh fruits and vegetables, like tomatoes and Korean pears. Lee’s has an almost overwhelming number of things for purchase, from a 25-pound bag of rice to a small box of Japanese Botan rice candy. 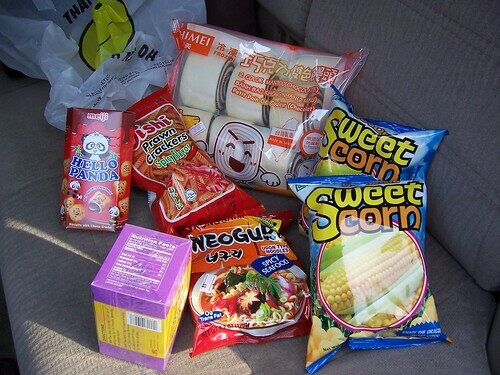 The store has frozen foods, like dumplings and lumpia wrappers; canned items, like water chestnuts; salty and sweet snacks, like Yan Yan (a Japanese product) or prawn crackers; all sorts of tea and bottled drinks; basic ingredients, like sesame oil, barley, and soybeans; and some housewares that include plates and rice cookers. Next to the checkout counter are handwritten and printed signs in Chinese, Korean, and English. Sushi rollers needed. Call Wayne, one read. Another advertised a restaurant for sale on South Clinton. The woman who rang up my purchases was friendly, and the prices are reasonable; I got everything in the photo above for about $12. (A sign tells customers about a $15 credit-card charge minimum, but the policy must not be too strict, because I paid with my Mastercard.) Even if you don't have something specific in mind to buy, Lee's is worth a trip. NEARBY: Tons, since Lee's is in Henrietta, land of big-box stores. But it shares a plaza with Lori's, the Ravioli Shop, and other local businesses. 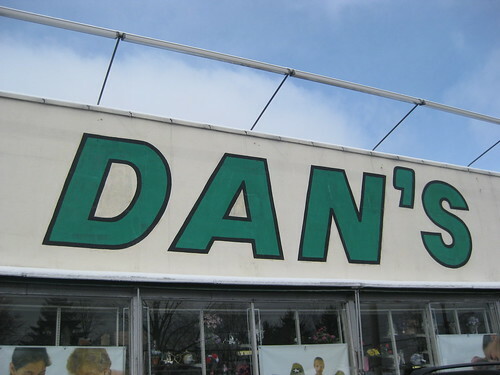 At Dan's, you'll find everything from a five-foot artificial sunflower to a foot-shaped cookie cutter, plus many kits containing everything you need to make the finished product. That might be a Mardi Gras mask, a kite, a model car, a dollhouse, a tie-dye shirt, origami… and more. ("And more" is a very useful phrase when describing this place.) The shelves are full of all sorts of art supplies, like yarn, ribbon, beads, and paint; materials like wood, metal, and foam; and crafting tools ("and more"). If you would rather that someone else do the creating, Dan’s also has board and card games and puzzles. Dan’s has plenty of things for kids, too, including Thomas trains, Playmobil sets, and small toy animals. Some of the craft kits are aimed specifically at children, allowing them to make a pirate ship, knitted hat, or several other fun things. You’ll also find some “miscellaneous” items at Dan's, like sea monkeys, or Giant Microbes (they make cholera cuddly! ), or tiny rubber bats (as in the animal, not the sporting equipment). Some of the store's stuff is in the “blast from the past” category, like boondoggle or those little flocked bears that I haven’t seen since elementary school. Unfortunately, Dan's didn't have a great selection of what I actually went to the store for--rubber stamps--so I didn't leave with any. But everyone I spoke with at the store was friendly and helpful, and I ended up picking up two impulse buys from the shelves near the register: two Sharpies, one teal and one violet, and a bag of Reese's Pieces. OK, I suppose that's technically three impulse buys. 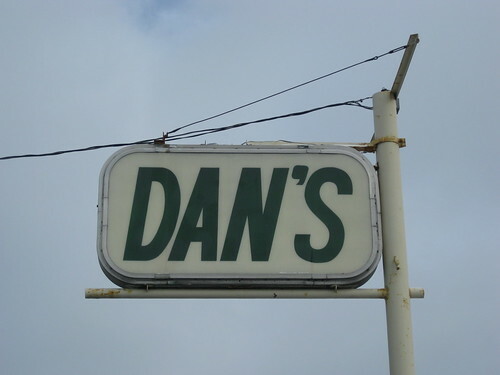 TIP: Dan's has a Facebook page that they update frequently. I had heard about Pastry Palooza (at the Genesee Center for the Arts & Education on Monroe Ave.) via Twitter, but I didn’t pay too much attention until I saw a mention in the paper last Thursday. The calendar listing mentioned sampling baked goods from local bakeries, and that’s all I needed to know—I love free samples, and I love bakeries. I cut out the listing and left it on the kitchen counter for Clem to see when he got home, simply writing “nom” in black marker at the top. Last Saturday was snowy and windy—a great day for staying in—but we decided to brave the storm and go. (After all, this is February in Rochester.) When we arrived, we paid the $5 each to get in (the admission fees benefited the Center) and took a look around at the tables full of cupcakes, cookies, brownies, and other treats. I remember seeing five bakeries represented there, but the event’s Facebook page lists seven, so either I missed two or those people didn’t make it. The bakeries were: JonJohn’s Bakery, Small World Bakery, Elegant Expressions, Donna Marie’s Gluten Free Bakery, and Cakes a Go-Go. Each bakery offered free samples as well as items for sale. Coffee and tea were available to buy, too. (Milk would have been perfect, considering all the cookies around—hey, after all, it’s scientifically proven!) I tried tidbits of a chocolate chip cookie, brownie, sweet potato pie, peanut butter chocolate cupcake, and a couple others. We couldn’t resist buying a few things, too. OK, more than a few. While we were there, we ate two cupcakes (peanut butter chocolate for me, and cherry 7UP for Clem, both from Cakes a Go-Go) and took home two cookies and a piece of chocolate cake from JonJohn’s, my favorite of the bakeries that took part. Their food was delicious, and the owners were so friendly, too. Nothing to do in Rochester? Not true. And I'll prove it! This is a Flickr badge showing public photos and videos from rediscoveringrochester. Make your own badge here. A Very Good Coat Rack.